I am retired and live near Cape Kennedy. I looked at an actual crawler and several rockets, spoke with “Cape” experts and examined models and photographs. I have seen lift-offs from up close as well as from my front deck. Recently, I incredulously witnessed an aborted night flight rocket. In this quilt, sunrise illuminates the rocket on the launch complex. 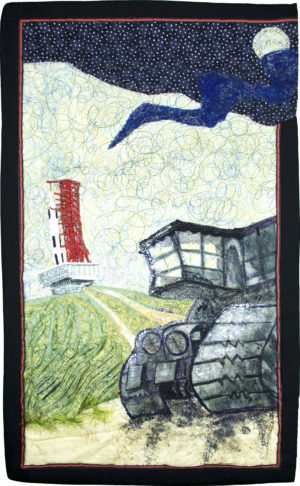 The crawler departs the launch complex at a ponderous pace. The magnitude of these structures is difficult to comprehend, the size of just one bolt in the launch complex will truly astound the viewer. This freehand drawing on muslin was pieced, hand stitched, free motion quilted and embellished with thread, netting lace, ribbon, markers and fabric paint. Layers of fabric (chenille) and fuzzy yarn create the illusion of grass. Trapunto emphasizes the interlocking crawler treads. Light blue fabric (sky)shines through the cutouts of gray fabric. The red tower is composed of melted red filament; blue sky is noted between the red lines. The white rocket was pieced, sewn, and embellished. The light blue sky was scrunched and has free motion quilting with iridescent netting. The dark blue cloud connects the light blue sky with the black star-studded night and fading moon. The black star-studded night escapes the binding and wraps around the back of the quilt. A thin red/black inner binding is encased within a broader black binding. Pieced, hand stitched, free motion quilted, embellished, trapunto. Muslin, netting, lace, ribbon, markers, fabric paint, chenille, fuzzy yarn, filament.